Alan Duncan Photography is a well established photography business with its studio and office based in Folkestone, Kent. Specialist services include aerial & commercial photography and the ever changing, fashionable world of wedding photography. Other areas of interest include PR photography, photo restoration and portrait photography. Gurkha Freedom Of Folkestone Parade. Joanna Lumley and Michael Howard applaud the Gurkhas at the Gurkha Freedom Of Folkestone Parade. 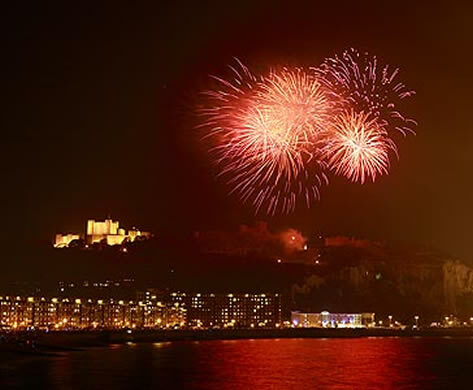 2012 Olympic Ceremony fireworks over Dover Castle. Photography in a grain store filled to capacity - without sinking! GIFT VOUCHERS FOR A PORTRAIT SITTING OR A PHOTOGRAPHY COURSE MAKE A THOUGHTFUL PRESENT! Alan Duncan's passion for photography started during his school years and has remained ever since. His professional training began in aerial photography, where after four years, he became chief photographer. Then the travel bug hit hard and he went to North America, teaching photography and then worked as a photographer on the cruise ships which took him to many exotic places such as The Caribbean. His desire to expand his knowledge of photography brought him into the additional and more creative areas of commercial and wedding photography. This diversity has stimulated extra enthusiasm in his work and indeed these different fields of photography all overlap in some way or form, to give him a more capable, stronger backbone to his photographic knowledgebase. His fully equipped studio is based in Folkestone, Kent and although most assignments are based within Kent, Alan frequently travels further afield. His main areas include aerial photography, industrial & commercial photography and wedding photography. Please click on the various links above for more information and folios in these different areas of photography. He is a qualified member of The Master Photographers Association. Commercial Photography in Folkestone, Hythe, Dover, Ashford, Canterbury, Maidstone, Medway, Thanet, all Kent areas, East Kent, West Kent and South East England.